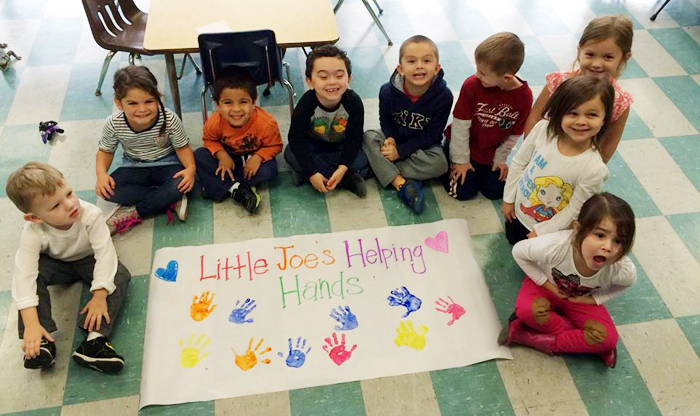 The pre-K class of St. Joseph the Protector School in Glenside is proud of their school's Helping Hands service project. The prayer partners of St. Joseph the Protector School, Glenside, work on a project. From the Kindergartners to the eighth graders, all the students at St. Joseph the Protector School in Glenside know exactly which charity is receiving the fruit of their generous hands: more than $2,000 raised to date, 10 full Thanksgiving dinners, over 400 Christmas gifts, 300 Valentine goody bags, warm winter clothing, and more. They know that charity is the Breathing Room Foundation because once a month the students come togther during the school day to work on creative projects, fundraising activities and charitable acts in support of the Jenkintown-based nonprofit that assists families for whom a member is dealing with cancer. 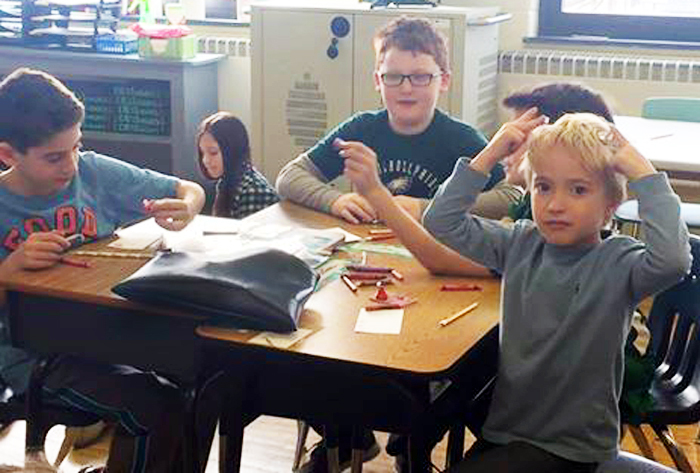 St. Luke the Evangelist Parish’s seventh- and eighth-grade PREP students are also supporting the charity in their weekly religious education classes. This academic year the school and PREP administrators integrated the Helping Hands service projects into the curriculum, which is proving successful not only for the charity but especially to the students and their families. All activities benefiting the Breathing Room Foundation take place each First Friday of the month, after Mass, with the students pairing up with their prayer partners to help support their 10 “adopted” BRF families. The students are in the middle of a “Chore for Change” fundraiser, from which 10 “Family Fun” gifts will be purchased for their adopted families. The gift will be day together for the familes, possibly catching a Phillies game, a movie and dinner at the family’s favorite restaurant or tickets to Hershey Park. The St. Joseph’s students will also be creating 24 Easter baskets filled wth treats for the children of their adopted families and will be filling more than 300 snack bags that will be distibuted to BRF families to use for nourishment during treatments or tucked into lunch boxes. In an example of “kindness inspires kindness,” one of the adopted BRF families donated a $1,000 tuition scholarship to St. Joseph the Protector, to be given to a graduating eighth grader.